Справка Zentimo - How to rename a device or change its image? 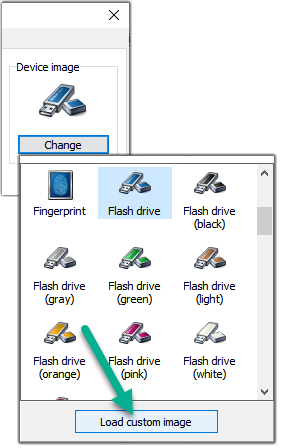 Справка > How to rename a device or change its image? Unlike Windows Zentimo displays real device names, given by a device manufacturer. Moreover, when you have several devices of the same type or a manufacturer has given an "obscure" name to a device you may assign a more intellegent name to those devices. Also to make the device recognition even more faster you can assign to the device an icon from the program package or load your custome one. The most common image formats are supported: JPG, PNG, ICO, BMP, etc. All these formats will be converted by the program to ICO format. When you have several external drives with identical names, you may prefer Zentimo to display automatically drives' volume labels instead of device names. To do so enable the option "Display storage device volumes" at the "Look and Feel" tab of the program options. You can rename a device or change its icon in the device properties dialog. See below step-by-step manuals on how to do it. How to rename a device? 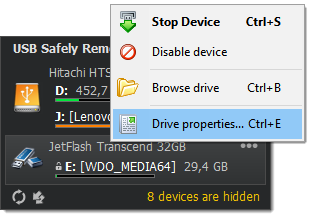 Call the device properties dialog: Right click to the device in the stop menu and select "Device properties" item. In the displayed device properties window enter a new name into the "USB Device Name" field. In order to return the previous (standard) device name, just clear "USB Device Name" field. How to change the device icon? Call the device properties dialog (see above) and press "Change" button under the device image. Just right click with mouse to an appropriate for you. Then press "Ok" button in the device properties dialog to save changes. How to assign a custom icon to a device? If you are not satisfied with the supplied icon set, you can load your own icon. 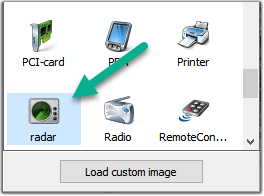 Press "Load custom image" button at the bottom of the select icon window. In the displayed open file dialog choose an image you are interested in. The program will scale an image to the required sizes automatically and add it to the internal storage. Press "Ok" to save changes in the device properties dialog. How to load the device icon manually? 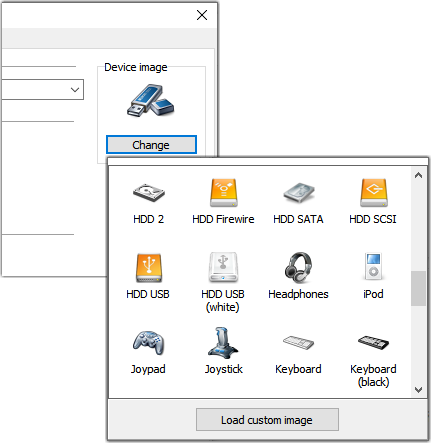 In this section we describe an alternative way of adding device icons which allows you to put your images directly to the internal image storage of the program without previous resizing thus without loose in the quality of images. You should use this way in case if you already have a needed ICO image in, which contains three pictures sized as: 16x16, 32x32 and 48x48 pixels. It's recommended to use 32-bit color-depth pictures. If you already have an icon in ICO format just copy it to one of the folders described above (UserDeviceImages is better), restart the program, then go to the device properties and select your newly added icon among other images.